4. 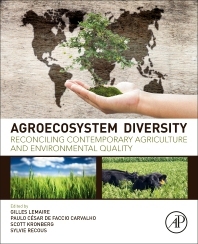 Diversified agro-ecosystem at farm level for more sustainable agriculture production? Dr Gilles LEMAIRE has had a 40 year research career at INRA Center in Lusignan devoted to ecophysiology of grasslands and forage crops, grazing ecology and plant-herbivore interactions. He directed the Research Unit “Forage and Grassland Ecophysiology” at INRA Lusignan (1986-1992). He was deputy director of Department Environment & Agronomy of INRA (1993-2002). He retired from INRA in 2009. He had a position of visiting professor at University of Porto-Alegre (Brazil) in 2011-2012. He has been elected as member of Academy of Agriculture of France in 2011. Paulo holds a doctorate in Animal Science from Universidade Estadual Paulista Júlio de Mesquita Filho (UNESP). His thesis was carried out at INRA-FR and investigated diet selection by grazing animals. He is Professor Titular at the Faculty of Agronomy of UFRGS, since 1997. He was Visiting Scientist at FAO for the theme of integrated crop-livestock systems (ICLS), and Coordinator of the Animal Science Advisory Committee of the National Counsel of Technological and Scientific Development (CNPq), member of the Committee on Low Carbon Agriculture, of the Advisory Council of Alianza del Pastizal/BirdLife International. He is Vice-President of the Brazilian Society of Animal Production. He holds a level 1A research productivity grant from CNPq; leader of the Grazing Ecology Research Group. He is author of 180 peer-reviewed papers, 81 book chapters, and edited 8 books. His papers have 1370 citations on Web of Science and Scopus, H factor 15 e 16, respectively, and 2439 citations and h-index 25 on Google Scholar. He scores 36.69 on Research Gate. He was Guest Editor on 4 international journals. His research approach is focused on the management and functioning of pastoral ecosystems, and ICLS. He leads the Coordination of PISA Extension Program reaching ~1050 small stakeholders in Brazil, and currently coordinates the UFRGS Postgraduate Course in Animal Science. Scott Kronberg has been conducting research on nutrition and feeding behavior of grazing livestock for about 25 years and plans to continue his research in ruminant nutrition and feeding behavior in respect to improving the nutritional value of red meat, reducing winter feeding costs for cows, and helping develop integrated crop and livestock production systems that are more economically and environmentally sustainable. Scott is a member of the American Society of Animal Science, the American Society of Agronomy, and the Ecological Society of America. Dr Sylvie Recous received her PhD in soil microbial ecology from the University of Lyon, France, in 1988. She is senior scientist at the French Institute for Agricultural Research (INRA). She has been conducting research on carbon and nitrogen cycling in soils and the environmental impacts of soil organic matters management for about 30 years, with recent development on relationships between management of cropping systems and greenhouse gas emissions, particularly N2O, with several projects at European and international levels. She has been a visiting scientist at CSIRO in Perth, Western Australia (1999-2000) and in University Federal of Santa Maria (UFSM), Brazil (2012-2016). Sylvie was associate editor of Plant and Soil (1997-2005) and of Soil Research (2011-2017) journals and is currently editor-in-chief of Agronomy for Sustainable Development. She has been elected as member of Academy of Agriculture of France in 2012.